Herbert Hoover, 31st president of the United States, once said, "In no other land could a boy from a country village, without inheritance or influential friends look forward with unbounded hope." The country village he had in mind was probably West Branch, Iowa, where he was born in 1874 and lived until the age of 11. Or, it might have been Newberg, Oregon, where he lived from 1885 to 1889. After his parents died within four years of each other, the orphaned Hoover boarded a train headed west to Oregon, arriving in the Quaker community of Newberg, in the Willamette Valley south of Portland. Here, his maternal uncle, Dr. Henry John Minthorn, served as country doctor and superintendent of the newly founded Friends Pacific Academy, a Quaker middle school. Hoover spent his adolescent years carrying out the usual farm and household chores and attending the academy, now known as George Fox University. In 1889, Hoover moved to Salem to assist in his uncle's real estate office. Here he learned typing and bookkeeping and attended a local business college at night. In 1891, he left Oregon and joined the first freshman class at Stanford University in Palo Alto, California. From there, he went on to a successful career as a mining engineer, humanitarian, and administrator. He was elected to the presidency in 1928. His Newberg home still stands at 115 South River Street on the north side of downtown, and looks much as it did when Hoover lived there. 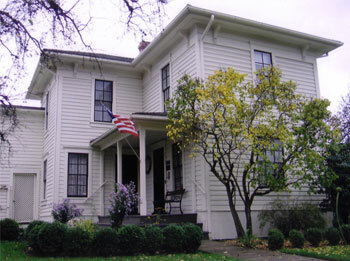 Built in 1881 by Jesse Edwards, the Quaker founder of Newberg, it is the oldest house in town. Like many historic homes, it experienced a number of "improvements" and remodelings over the years. After the Minthorns left town, the house changed hands several times and was being used as a boarding house at the end of World War II. In 1947, a group of Hoover's friends led by Dr. Burt Barker Brown of the Oregon Historical Society became interested in purchasing and restoring the house, and a small foundation was formed. When Hoover visited the property prior to restoration, he couldn't believe it was the same house he had lived in as a boy. The location was correct, but nothing inside was as he remembered until he went upstairs and immediately recognized his old bedroom. Efforts to return the interior to its original design were assisted by two local sisters who had grown up in the house and were able to recall its appearance in the days after Hoover moved. In 1955, with the restoration completed, a gala dedication ceremony drew over 3000 attendees including Herbert Hoover, 81, as keynote speaker. Today, the house is owned by the National Society of Colonial Dames in the State of Oregon and is operated as a museum open to the public. Most of the furnishings are period objects collected from the community, but a few pieces of furniture including Hoover's bedroom set and a pair of platform rockers in the living room are original. There are many family and personal photos of Hoover scattered about in the six rooms. The pear tree in the back yard, planted in 1879, still produces pears and is designated as an Oregon Heritage Tree. When young Hoover first arrived in Newberg, the pears were being harvested and made into pear butter. Having never seen or tasted a pear back in Iowa, Hoover was smitten with the fruit. As he wrote to a former teacher, "But after almost two days of almost exclusive pear diet, I did not eat pears again for years." The museum is open between March and November, Wednesday through Sunday from 1-4pm; during December and February, it is open on Saturday and Sundays only. The museum is closed in January and for most major holidays. Admission is $3 for adults and $2 for seniors. For more information, call 503-538-6629. Hours: March - November, Wednesday - Sunday 1 to 4 p.m. December and February, Saturday and Sunday 1 p.m. to 4 p.m. Closed January and holidays.